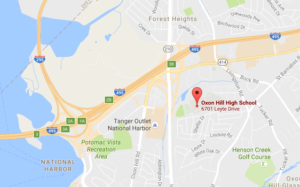 Location of OHHS (Source: Google Maps). .2. Follow I-495 S / I-95 S to Forest Heights. Take exit 3 from I-495 S / I-95 S.
3. Merge onto I-495 S / I-95 S.
4. Use the right lane to keep right at the fork and stay on I-495 S / I-95 S.
5. Use the 2 nd from the right lane to take exit 3 for MD-210 toward Forest Heights / Indian Head. 6. Continue on MD-210 S / Indian Head Hwy to your destination in Oxon Hill. 7. Turn left onto MD-210 S / Indian Head Hwy. 8. Use the right 2 lanes to take the ramp onto MD-414 E / Oxon Hill Rd. 9. Turn right onto Clipper Way. 13. Destination will be on the right. 1. Use the right 2 lanes to take the Interstate 95 N / Interstate 495 E ramp. 2. Merge onto I-495 E / I-95 N.
3. Take exit 3B toward MD-210 N / Forest Heights. 4. Use the left 2 lanes to turn left onto Oxon Hill Rd. 5. Stay in the right lane of the 2 left lanes. 6. Turn right onto Clipper Way (this is an immediate right turn). 10. Destination will be on the right. 1. Continue on I-395 S to I-295 S.
2. Take I-295 to Oxon Hill Rd in Oxon Hill. 3. Take exit 3B from I-495 N / I-95 N.
4. Use the left 2 lanes to turn slightly left onto I-395 S (signs for Interstate 395 S). 5. Use the left 2 lanes to take exit 7 toward I-295 S.
7. Use the left 2 lanes to take exit 2A for I-295 S toward I-95 / I-4. 8. Merge onto I-295 as you enter Maryland. 9. Use the left 3 lanes to take exit 1A-1B to merge onto I-495 N / I-95 N toward Baltimore. 10. Take exit 3B toward MD-210 N / Forest Heights. 11. Use the left 2 lanes to turn left onto Oxon Hill Rd. 12. Stay in the right lane of the 2 left lanes. 13. Turn right onto Clipper Way (this is an immediate right turn). 11. Destination will be on the right.